It's baby number 5 for celebrity chef Jamie Oliver and wife Jools! It’s baby number 5 for celebrity chef Jamie Oliver and wife Jools! It’s the news that’s setting social media on fire! 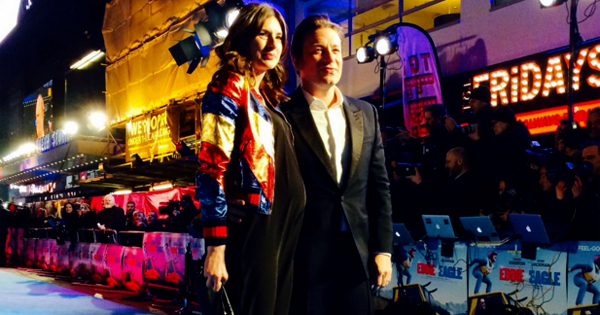 Celebrity chef Jamie Oliver and wife Jools have another bun in the oven! There was no disguising the mother-of-four’s bump when she took to the red carpet with chef husband Jamie for the European premiere of Eddie The Eagle in London earlier today. And while they have yet to officially confirm the news, Jamie has retweeted these photos from Twitter showing Jools’ prominent bump, alongside news announcements that another baby Oliver is on the way. The pair have been married for 15 years and are already parents to Poppy Honey Rosie, 13, Daisy Boo Pamela, 12, Petal Blossom Rainbow, six, and Buddy Bear Maurice, five. According to some reports, the baby is due in August. Jamie told reporters that while he was “really pleased”, he never expected to welcome a fifth child into the Oliver clan. “Basically I do what I’m told but she’s an amazing family maker and I just go with it. The surprise pregnancy news comes after Jamie, who is outspoken when it comes to children and health food, announced a new campaign to support breastfeeding. Jamie told a British radio station yesterday that breastfeeding is “the beginning of the story” when it comes to childhood obesity and that Britain has a “problem” with breastfeeding. “We need to support the women of Britain to breastfeed more, anywhere they want to,” he said on radio. “It’s easy, it’s more convenient, it’s more nutritious, it’s better, it’s free.